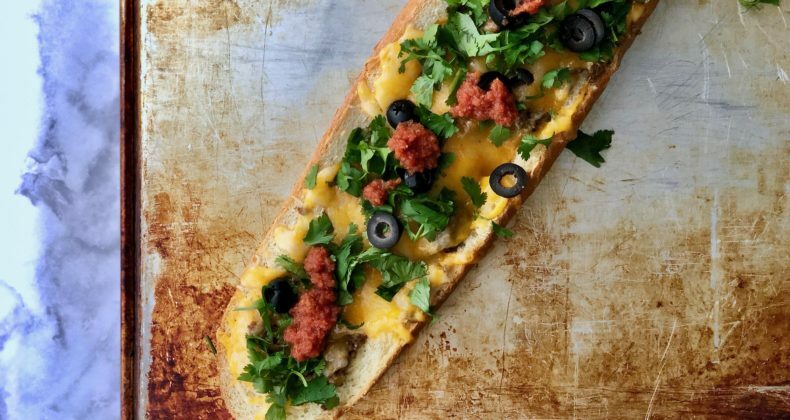 Taco Bread is the perfect lunch, dinner, or appetizer snack. How was this born? 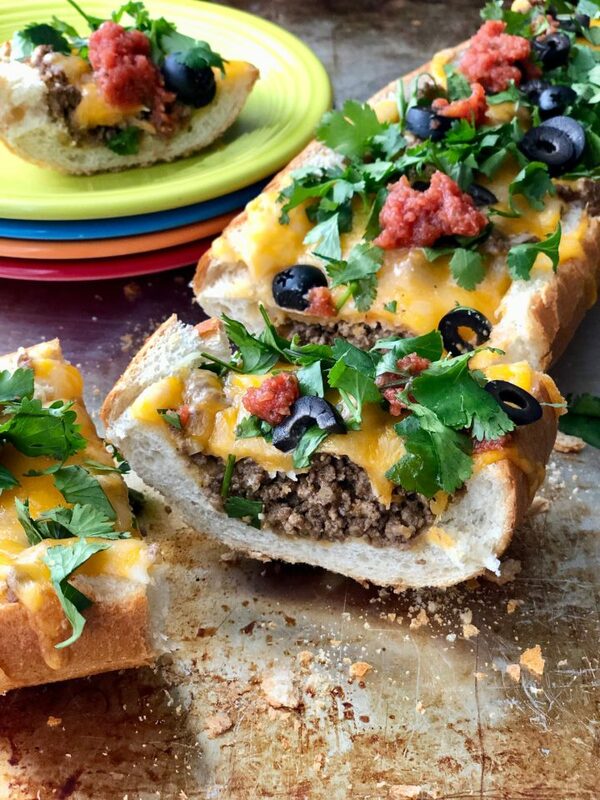 Well, to be honest, it was all out of necessity, I had leftover taco meat in the fridge and a loaf of day-old French bread on the counter. They both needed to be used up this week and I happen to be all out of taco shells. The school serves something called Taco Burger, which basically sounds like taco seasoned ground beef on a bun. A tex-mex version of MaidRites if you will. So out of necessity and getting inspiration from the school lunch menu (of all places!) 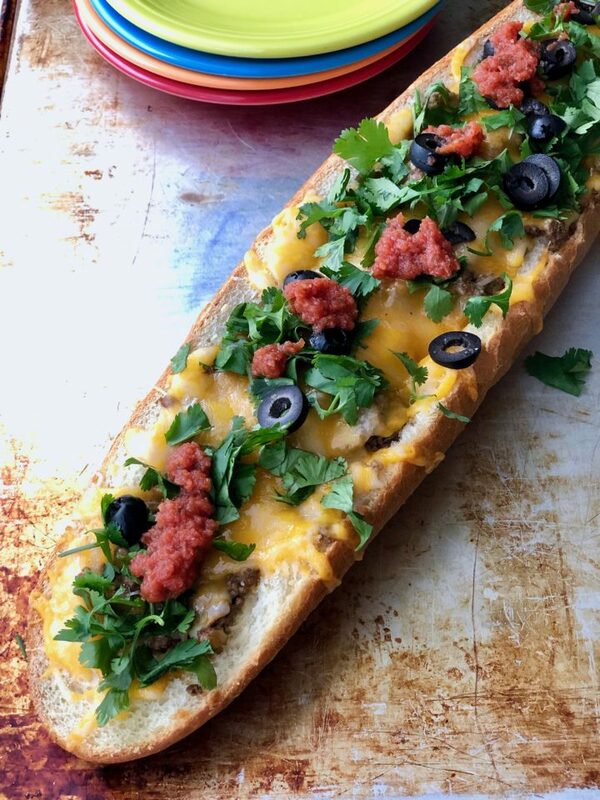 Taco Bread was born. There are all kinds of stuffed bread recipes out there and this recipe follows the same basic formula. I cut my French bread in 2/3. Let me explain. Instead of cutting in half I cut the top 1/3 off, leaving more room in the bottom 2/3 to fill with cooked taco meat. Once your bread is sliced scoop out the soft insides –you want to make room for the filling. Save the “guts” and the top to snack on or turn into croutons or a Panzanella salad. For the meat, I used my all-time favorite go-to Mexican Ground Beef but you could just brown up some burger and toss in some taco seasoning to save yourself time. It is worth it to make the Mexican Ground Beef though–totally biased opinion, I know. I served this for lunch on a snow day but I think you could easily serve this as an appetizer or snack at any party. “We can eat Taco Bread if we want to. We can leave your friends behind. ‘Cause your friends don’t eat Taco Bread and if they don’t eat Taco Bread, Well, they’re no friends of mine” Those are the lyrics right?! Serve this at your upcoming Super Bowl party, Bachelor viewing party, award show party, baby shower, etc. It will be a hit! If you make this tag me on Instagram @thekitchenarium I love to see your pictures! Top with your favorite taco toppings: lettuce, cilantro, onions, olives, tomatoes, salsa, sour cream, guacamole, avocado, etc.